Aerobus technology is recognized and respected throughout the world. Today's Aerobus is the result of a consistent, ongoing engineering and research activity. The following provides a timeline of Aerobus installations. Currently, Aerobus has projects in various stages of development in the United States, China and South Korea. Serving as a people mover on an ecological reserve, this first Aerobus installation tested long spans and the feasibility of a portable pylon floating on a lake. After a series of successes, the entire system was sold and moved to a ski resort in Canada. Expanded to a suspended guideway length of 820 meters, about one-half mile, the system carried patrons of a ski area from their lodges to the lifts in all weather conditions. In May 1981, the Urban Mass Transportation Administration (UMTA), part of the U.S. Department of Transportation, inspected the operation and produced a most favorable report on the system. A 500-meter circular track was designed to perfect an upgraded, articulated vehicle. Trials resulted in the design used for the Mannheim, Germany, installation. The 2.8 kilometer Aerobus guideway crossed the Neckar River, linking two parking sites of the Bundesgartenschau, or Federal Garden Show, in Mannheim, Germany. During a six-month period between April 1 and October 19, when the show ended, more than 2.5 million passengers rode the system without incident. The Urban Mass Trans- portation Administration (UMTA), an agency of the U.S. Department of Transportation, sent an independent engineering firm to Mannheim, Germany, for the purpose of evaluating the Aerobus system. Their highly favorable assessment, called the UMTA report, was released later that same year. An 8.3 kilometer development track with a 12% grade to further refine the Mannheim system, was planned and constructed. 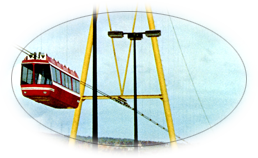 This guideway was the first to use aluminum rails fitted over the cables to provide a smoother ride. The first all-wheel-drive vehicle was also developed and improved. In May 1981, the Urban Mass Transportation Administration (UMTA), inspected the Ste. Anne, Quebec, Canada, operation and produced another very favorable report on the system. Aerobus was named a winning technology in the U.S. Government-sponsored competition for a light rail system to be constructed in the city of Milwaukee, Wisconsin, USA. Long-term financing commitments are now being sought. Aerobus management committed necessary funding for a multi-stage product enhancement project. This continuing effort has expanded the Aerobus design envelope and assures that Aerobus engineering takes full advantage of all advances in the field.